(1) There is no difference in BMI between patients who have participated in a medically-supervised weight management program and those who don’t. (2) MSWM does not change self-reported adherence, physical activity, eating behavior, and health beliefs. Methods & Procedures: 55 patients were scheduled for laparoscopic adjustable gastric banding (LAGB) and consented to enroll in an ongoing prospective pilot study in a large public hospital. Of these, 12 patients cancelled surgery and 10 patients have been enrolled for less than 6 months. Thus, 33 patients were included in the analysis, with 17 randomized to MSWM (defined as monthly visits over 6 months directed by a physician or nutritionist) and 16 randomized to usual care. 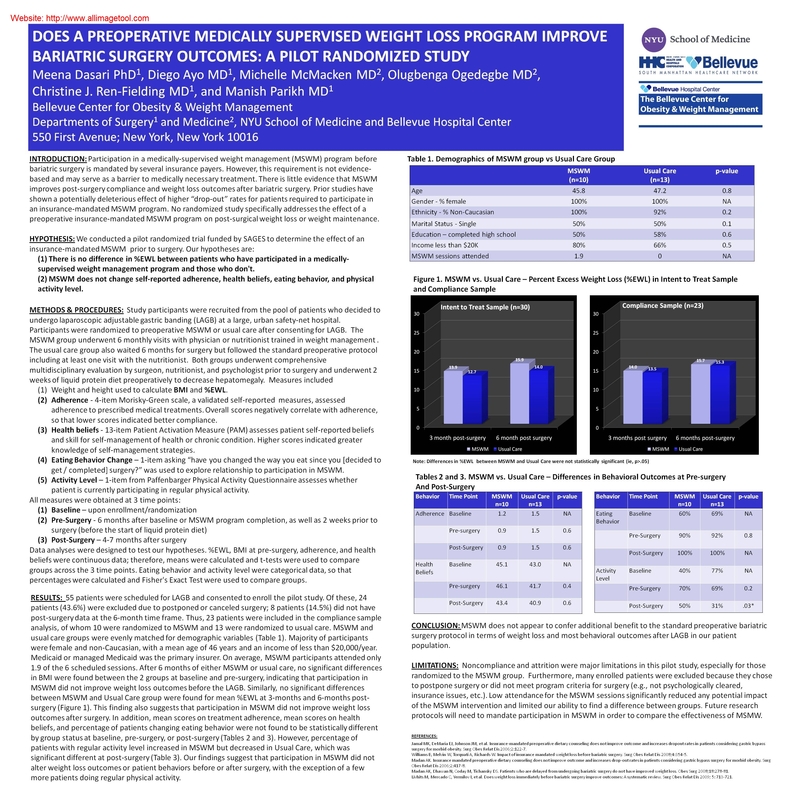 Measures of weight, height, adherence, activity level, health beliefs, and eating behavior were obtained at enrollment (ie, baseline) and 6 months after enrollment (ie, MSWM program completion and 2 weeks prior to surgery). For categorical and continuous data, Fisher’s Exact Test and t-test were used to compare groups at the 2 time points before surgery. Results: Mean age was 45.5 (SD=12.5) years. Majority were female (97%) and non-Caucasian (85%) with an income of less than $20,000 (64%). No significant differences were found between MSWM and usual care for age, gender, ethnicity, education, and income, indicating that the 2 groups were evenly matched for demographic variables. Mean BMI for the MSWM group was 46.3 kg/m² at baseline and 46.0 kg/m² at 6 months. Mean BMI for usual care was 44.7 kg/m² and 44.6 kg/m² (see Table 1). After 6 months of either MSWM or wait and at pre-surgery, no significant differences in BMI or patient behaviors were found between the 2 groups. Preliminary analysis of available 3-month post-operative data (n=13) showed similar mean BMI when comparing MSWM (41.3 kg/m²) and usual care (41.2 kg/m 2). Conclusion: Our preliminary results indicate that MSWM does not affect BMI changes or patient behaviors prior to or after LAGB surgery.